Can Target get any better? Honestly? Thanks to Twitter, I just learned that Caldrea is launching a new line of luxe cleansers and home scents for Target in April. Expect unique packaging and scents like Citron Ginger, Herbs of Provence, Jasmine Mint, Lavender and Olive Oil on hand lotion, linen spray and more. Caldrea for Target will be affordably priced from just $5.99 to $19.99. Now I won't have to scour the shelves at T.J. Maxx and Marshalls for my discount Caldrea hand soap anymore. Joy! 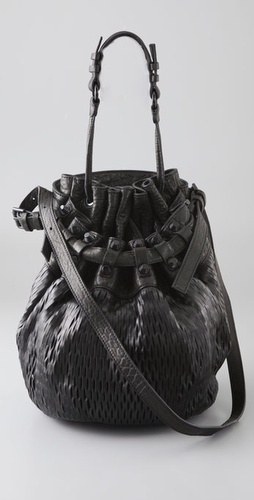 Alexander Wang's 'Diego' Mesh Bucket Bag is $825 at shopbop.com. Definitely one of spring's most wanted bags. Get the look for less with this Deux Lux Tassle Bucket Bag, available at Urban Outfitters for $68.